Last week, I put up Scott Ott’s: ‘Axis of Weasels’: article. Since then I’m sure many of you have wondered how you can tell a French weasel from a German weasel. Well, never fear, because RWN is here to help! If you look to your left, you’ll see the dreaded French weasel. This weasel can be distinguished by it’s yellow belly which is usually only seen for mere moments before the French weasel turns and runs away. If the belly of the weasel is not visible because it’s hiding in a hole or looking for a way to attack from behind, the distinctive odor of cheese will let you positively identify this species of weasel. French weasels tend to be untrustworthy yet treacherous. Anyone who doesn’t watch a French weasel closely is likely to soon feel a vicious bite on the back of his ankles. 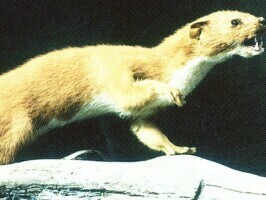 This is the savage German weasel. It’s face is contorted in a snarl of rage which usually means that it is seeking to intimidate other weasels into giving up part of their territory. Fortunately, this species was declawed long ago and now it’s generally harmless. On the other hand, the German weasel has learned to use incessant whinging about the American eagle as a defense mechanism which makes it almost as insufferable as the French weasel. If you run into either of these weasels in the wild, the best strategy is to simply ignore them. Some people may claim that the French weasels make nice pets, but many people have had bad experiences with them. That’s because the French weasel will often try to turn all the other neighborhood animals against you even as it condemns your cultural imperialism for making it defecate in a litter box instead of on the floor. So take my advice my friend, if you see a French or German weasel, just keep on walking.